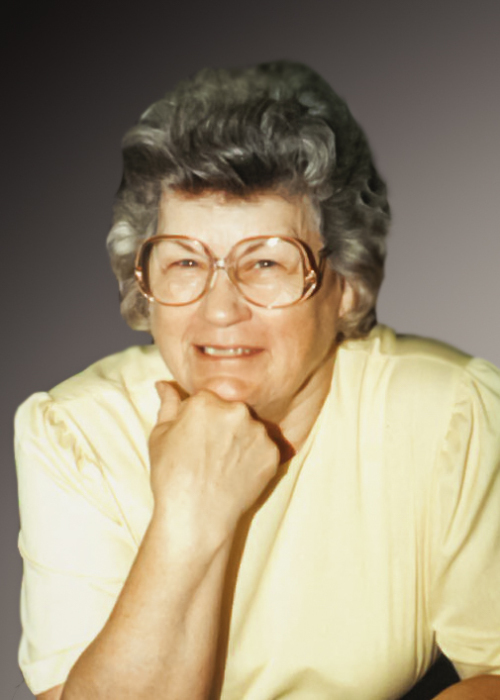 Obituary for Elnora Marie Poindexter | Myers Funeral Home, Inc.
Elnora Marie Poindexter, 95, of rural Wellsville, passed away Tuesday, October 16, 2018 at Frene Valley in Hermann, Missouri. Mrs. Poindexter was born August 11, 1923 in Harrold, South Dakota, a daughter of Alton Everett and Beulah Lee (Deardorff) Boicourt. She was a 1940 graduate of Martinsburg High School, where she was the Valedictorian of her class. In January 1942 in Montgomery City, Missouri, she married Don Franklin Poindexter. He preceded her in death on May 11, 1981. Elnora had lived at her present address all of her married life. She was a bookkeeper for the Wellsville Garment Factory for several years. Elnora had also been a school teacher for a few years and was a caregiver for several people. Elnora enjoyed cooking, baking and canning. She also liked to crochet. In later years, Elnora became quite the avid St. Louis Cardinals fan, even taking notes and being able to tell you what took place in the game. More than anything, Elnora loved her family. Elnora is survived by her two sons and daughters-in-law, Donald Larry and Peggy Poindexter, of Wellsville and John Franklin and Barb Poindexter, of Martinsburg; five grandchildren and spouses, Lorne and Tonya Poindexter, of Montgomery City, Tamara Poindexter, of Boonville, Jason and Brooke Poindexter, of Martinsburg, Justin and Nicki Poindexter, of Martinsburg and Jessica Poindexter-Raup and Eric Raup, of St. Peters; six great-grandchildren, Casey Poindexter and wife, Jennifer and Lukas Poindexter, of Montgomery City, Alex and Andrew Poindexter and Maci and Leah Poindexter, of Martinsburg; sister, Neva Lee Poindexter Winfrey, of Wellsville; in addition to numerous nieces and nephews. She was preceded in death by her parents; husband, Don Franklin Poindexter; five sisters, Julia Ann Boicourt, Leona Maxine Branson, Aleta May Meyer, Beulah Irene Baker and Eva Mae Aulbur and four brothers, Harold Alton Boicourt, Everett Lee “Dutch” Boicourt, Adrain Elmer “Shorty” Boicourt and Wayne Harry Boicourt. Funeral services were at 2:00 p.m., Thursday, October 18, 2018 at the Myers Funeral Home in Wellsville. Rev. Dawn Gerard officiated. Burial was in Bethel Cemetery in rural Montgomery City. Serving as pallbearers were Casey Poindexter, Lorne Poindexter, Lukas Poindexter, Tonya Poindexter, Steve Poindexter and Walt Higgenbotham. Honorary pallbearer was Kenny Claspille. Visitation was held from 12:00 noon until the time of service, Thursday, at the funeral home. Memorial contributions were suggested to Bethel Cemetery c/o Myers Funeral Home, 203 East Bates Street, Wellsville, MO 63384.